Deepak Kumar has had 17 years of very hard life. Deepak's family lives in a one-room tenement in Ranchi, struggling almost every day to make ends meet. Despite the hardship, Deepak has an excellent track record. He topped his school (Vivekananda Vidya Mandir) in CBSE Class XII (Biology) this year. Besides being academically brilliant, Deepak is like fresh air. If you speak to Deepak or meet him away from his home, you will have no idea how much hardship he encounters every day. His enthusiasm and positivity is remarkable and contagious. 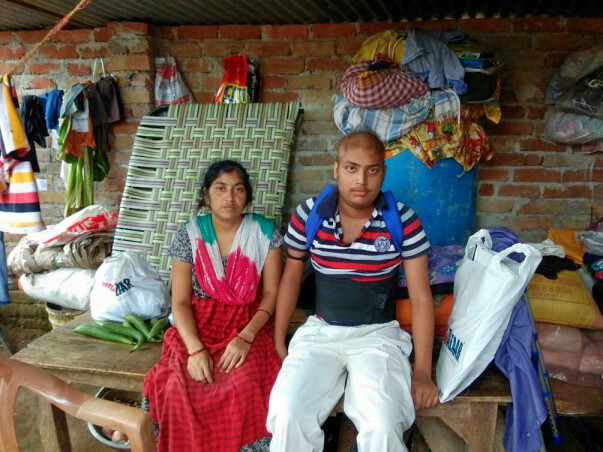 Deepak had been to a counselling session for admission to a medical college in June this year, where he sustained a minor injury. 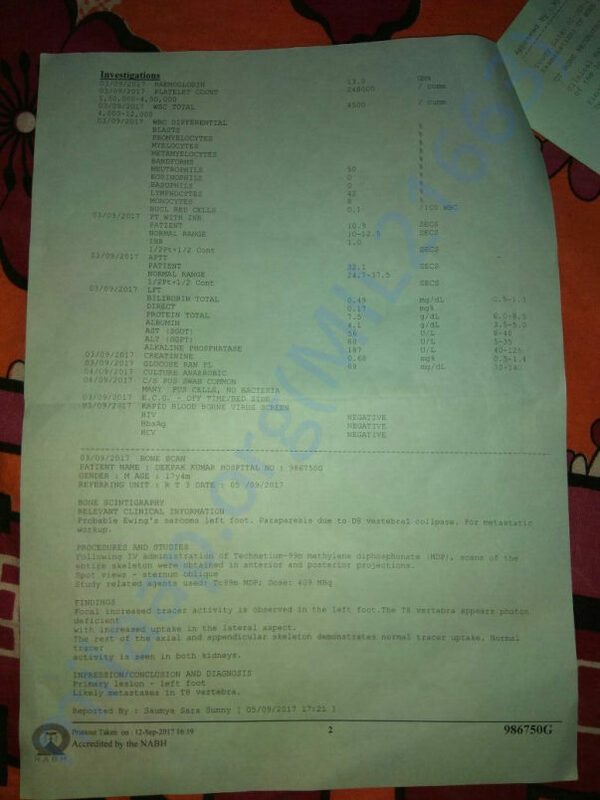 Following this, he developed a progressive swelling on his left foot, for which he was given symptomatic treatment and was sent to Delhi for an open biopsy. He was then taken to CMC (Vellore). Doctors at CMC discovered that he has Stage IV A bone cancer (Metastatic Ewing Sarcoma)! It started at the ankle and then spread to his lungs and both kidneys. His spinal cord is affected because of collapse of T7 & T8. In the picture, you can see that he is using Taylor's Brace in order to support his spine. We are a group of people who were sponsoring Deepak's education. Just when we thought Deepak was on his way to achieving his dream, this news hit us like a bolt. While the situation is very bleak, we're not ready to give up hope. Not so soon. Deepak's father (Mr. Shiv Shambhu Dwivedi) is a Security Guard and earns about Rs 9500 a month--the only source of income for the family of four (Deepak has a younger brother). It is impossible for him to meet the expenses of the treatment on his own, but he is also a man of hope. "Main Deepak ke liye sab kuch karoonga," (I will do everything possible for Deepak), he says confidently. Deepak says, "Mentally main strong hoon, bas yeh kharab lag raha hai ki ek year lose ho gaya," oblivious to the extent of damage the cancer is causing inside him. The only hope for Deepak is to receive good and timely treatment. Obviously, this is going to be a long, tiring and very expensive journey. 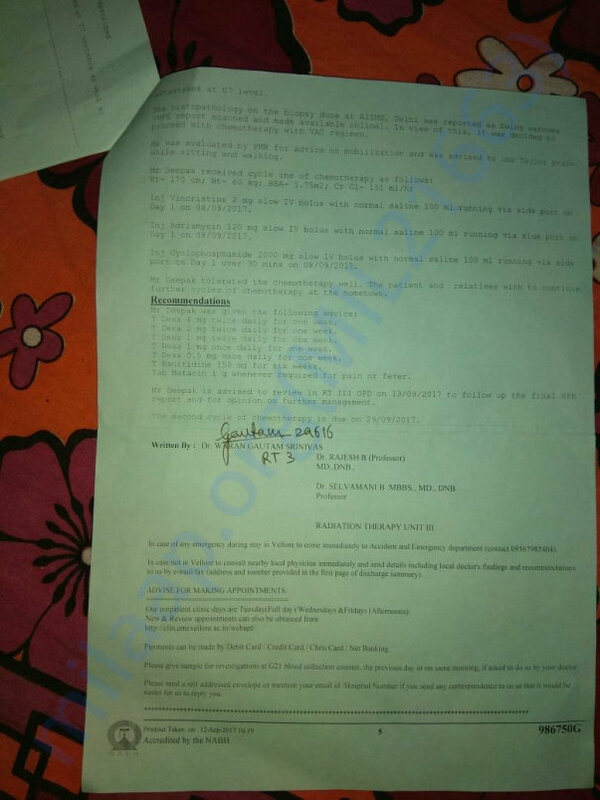 He will take the prescribed treatment at Ranchi and will be required to visit Vellore periodically. This is an appeal to contribute generously. Your monetary contribution can help this bright kid fight cancer and live to follow his dream. Who knows, how many lives he might end up saving as a doctor. Your contribution will be used to meet's Deepak's medical and associated expenses. Those of you who believe in prayers, do pray for Deepak. Thank you for the wonderful support. Deepak was able to undergo the recommended chemotherapy and radiotherapy sessions, thanks to the support of friends, family and donors like you. His condition was showing improvement. However, the latest PET scans show progressive disease in view of new bone lesions. It is probable that Deepak would have to go for stem cell therapy. 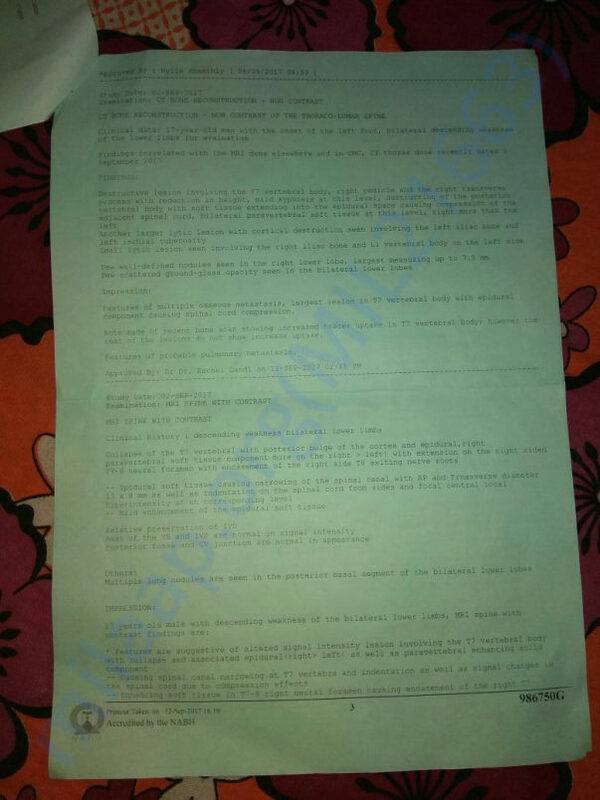 His latest case paper from CMC Vellore is enclosed. The financial challenge continues to be severe but Deepak continues to maintain a positive frame of mind. Your donation will go a long way in the helping this bright kid in his brave fight against cancer. Requesting your kind donations and support once again. Deepak is taking chemotherapy sessions at Ranchi as directed by the doctors of CMC, Vellore. He has had two already; the third one is due on 18th Nov. After completing five sessions, he will visit CMC for further investigations and the doctors there would suggest the future course of treatment. Your donations and kind words are a source of strength for Deepak and his family. 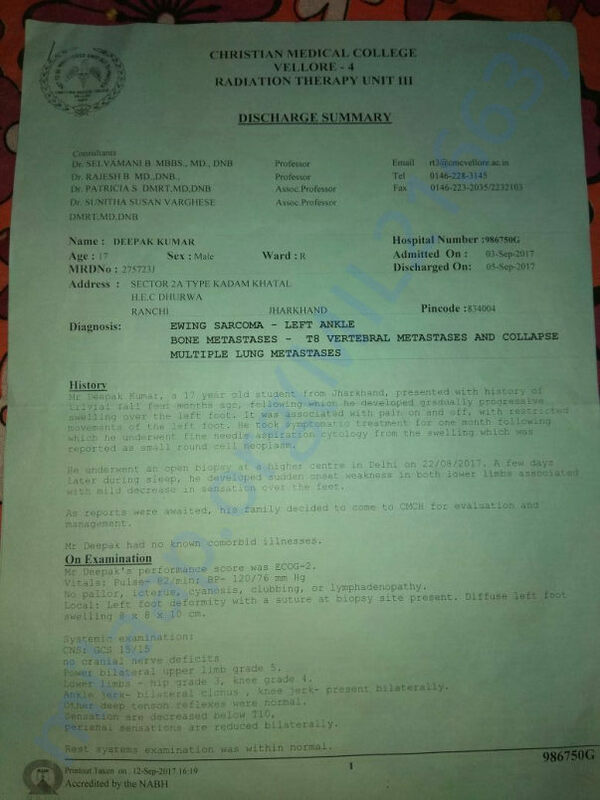 So far, Deepak's medical and associated expenses at AIIMS (Delhi), CMC (Vellore) and RIMS (Ranchi) have cost Deepak's father more than Rs 1.5 lacs. Your donation is helping him partially settle his debts that he had taken to meet these expenses. He is getting back the confidence that lack of finance won't come in the way of Deepak receiving timely treatment. Out of the total donations collected so far, approx Rs 57,000 has been transferred to Deepak's father's account. I have requested Milaap to transfer approx another Rs 10,000. This will be a significant support for him, both financially and mentally. Every transfer request is accompanied by relevant bills and invoices. The collection drive has now hit a low. There's hardly any new donation coming in and we've not even crossed the 1 lac mark. While I am deeply grateful to you for your contribution, I seek another help. Please spread the word. Please talk to your friends and family about the case. Please write about him and share the donation link ( https://milaap.org/fundraisers/savedeepak ) via social media like Facebook, WhatsApp, etc. Your contribution and words of encouragement are helping Deepak immensely in his brave fight against the deadly disease. He is taking chemotherapy sessions at Ranchi, as directed by the doctors of CMC, Vellore. Each chemotherapy session, as you might know, takes a huge toll on the patient's energy levels, but Deepak--the indefatigable youngster that he is--is taking it all in his stride, doing his best to stay mentally and physically strong. Deepak remains committed to his dream of becoming a doctor, he spends most of his time studying. 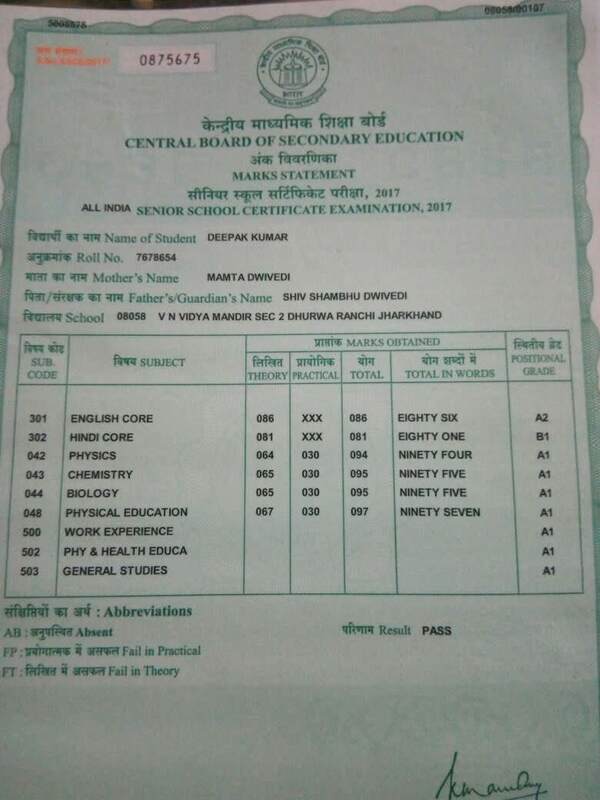 As you might remember, he is his school's Biology topper (see his 12th grade Marksheet below). Hats off to Deepak's family (parents and younger brother) who are providing rock-solid support on all aspects. 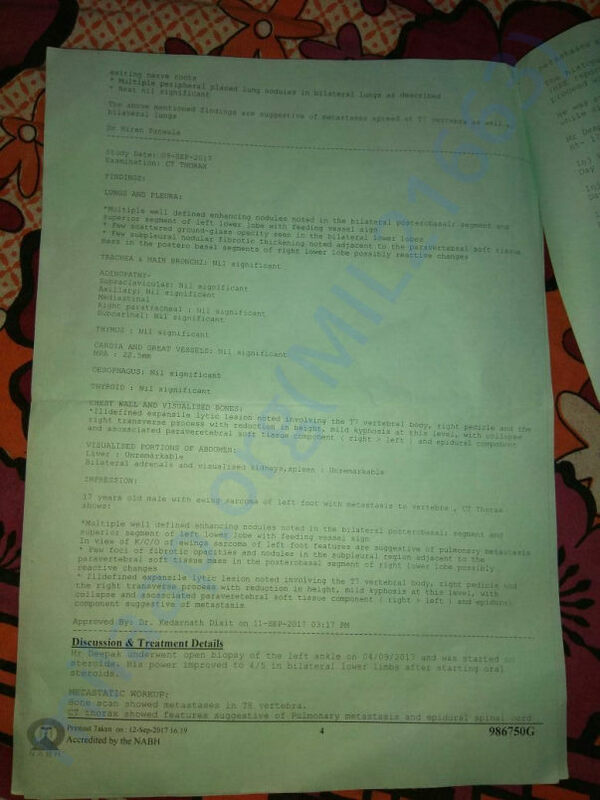 So far, Deepak's medical and associated expenses at AIIMS (Delhi), CMC (Vellore) and RIMS (Ranchi) have cost Deepak's father more than Rs 1.5 lacs, but not once has he hesitated in meeting these expenses. Despite his meagre wages, he has somehow managed to raise the money whenever required. I have requested Milaap to transfer approx Rs 57000 out of the money collected so far to Deepak's father's account immediately so that he doesn't drown in debts and lose all hope. This will be a significant support for him, both financially and mentally. Bills and invoices for this amount have been provided to Milaap. As you can imagine, this is going to be a long and epensive journey. Please continue to stand by Deepak, and do share this plea for help in your circles. Deepak's family sends their deep gratitude to you. Best of luck for your future. Stay strong, never lose hope.